Ideal for the summer months, three distinctive varieties – Earl Grey, Berry & Hibiscus and Jasmine Bud, have been created especially for The Wolseley by our new tea partners, Canton, in close collaboration with our Head Barista, Lukas Krupala. Each is a refreshing blend of the finest hand-picked teas infused with citrus peel, served over ice and topped with chilled soda water. The tea leaves we use are bought fresh each season directly from small, well-established tea gardens and close relationships with the farmers ensure every leaf is carefully handpicked and handcrafted to tease out the sweetest notes and most complex flavours. Whether enjoyed as an alternative to your usual cup of English Breakfast for a cooler start to the day, as a revitalising afternoon refreshment accompanied perhaps by a cucumber sandwich, éclair or macaroon, or as your non-alcoholic aperitif of choice, do ask to try these uplifting iced teas the next time you are in the restaurant. The selection of iced teas, each priced at £4.50, is available to enjoy at The Wolseley until the end of September. Bright and refreshing, this classic iced tea is an elegant infusion of Earl Grey with heady botanical notes of citrus. An uplifting infusion of whole summer berries, hibiscus flower, tart apple and a hint of liquorice root, giving a sweet and fruity iced tea with no caffeine. Smooth green tea leaves infused with the sweetest notes of jasmine blossom make this a light and refreshing iced tea with bright aromatic notes. P.S. And for those who have especially enjoyed the Jasmine Bud, you are able to recreate this cooling refreshment at home. 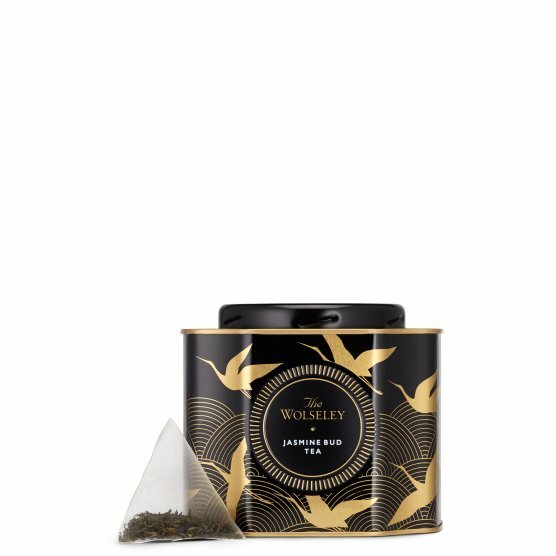 Our Jasmine Bud tea caddy is available to purchase from The Wolseley Shop (both online and at The Wolseley Shop at Bicester Village) and the recipe can be found here.